Therefore, Xao’s general ledger will include a separate page for each of these nine accounts. Next, consider how the details of each specific account can be determined through a process known as posting. To “post” means to copy the entries listed in the journal into their respective ledger accounts. In other words, the debits and credits in the journal will be accumulated (“transferred”/”sorted”) into the appropriate debit and credit columns of each ledger page. The following illustration shows the posting process. Arrows are drawn for the first journal entry posting. A similar process would occur for each of the other transactions to produce the resulting ledger pages. 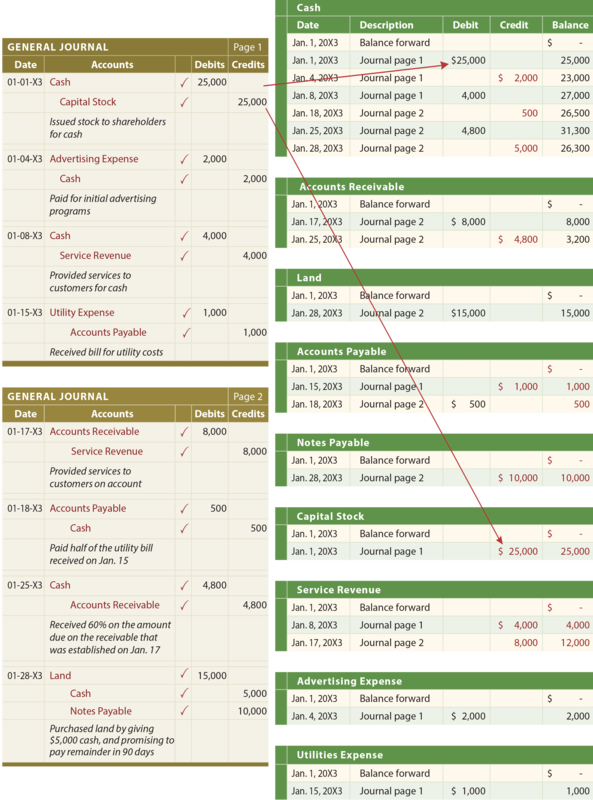 In reviewing the ledger accounts below, notice that the “description” column includes a cross-reference back to the journal page in which the transaction was initially recorded. This reduces the amount of detailed information that must be recorded in the ledger, and provides an audit trail back to the original transaction in the journal. The check marks in the journal indicate that a particular transaction has been posted to the ledger. Without these marks (in a manual system), it would be very easy to fail to post a transaction, or even post the same transaction twice. Understand the need for accounts, and recognize that a collection of accounts comprises the general ledger. Be able to construct and “operate” a running balance form of account. Understand the need and application of posting. Be able to describe the steps by which information form source documents is transferred to the ledger. Be able to distinguish between a journal and ledger. Know why a ledger is needed, in addition to a journal.